Stella Arnaldo's Blogspot: Ok I'm awake now! But WTF?!?! YEAH, yeah, I've been mostly dozing through the holidays and have been lazy to blog these past couple of weeks. Blame it on the unhealthy diet of pork, beef and a whole lot of carbo-protein dishes that have not only clogged my arteries but has turned my brain matter into swill. Besides the weather has been so balmy lately, it just made better sense to keep staying in bed save for the token once-a-week visits to the gym to justify my monthly credit card bill to which my gym dues are charged. What finally woke me up today was a nice catty and entertaining chat with my forever favorite economist – yeah, one of those who taught the presidentita and is now ashamed of it. I had to interview him for a piece I'm doing for a publication abroad on the impact of a Democrat win on the U.S. dollar and the economy. In between the usual academe-speak of solving the U.S. budget deficit and our own possible bets for the 2010, there was much gossip traded about the usual goings on in the government. According to favorite economist, the word that has been going around since last December was that Malacañang now has its eye on a new director-general for the NEDA. At this point this is probably old news already, but this was the first time I've heard of it. It downright shocked me into consciousness like a defribillator. It's none other than Mr. ex-Senator walang baba, Mr. Ate Vi himself, Ralph Recto! And I'm like, WTF?!?!?! Is this another cruel joke being perpetuated on us, the innocent poor citizens of this godforsaken country, by the freakish resident in Malacañang?! I AM NOT AMUSED! But favorite economist says Mr. E-VAT has actually been "feeling economist" ever since he chaired the powerful Senate Ways and Means Committee. At one agency's budget deliberation, the story goes, Sen. Mr. Vilma Santos tells the agency's heads, "Let's not talk about your budget because it's very small. Let's talk about development issues." Eff! and double eff! Ano ba itoh? Of course, for the present dispensation in the Palace by the smelly river, it makes sense to have another clueless but compliant dolt running NEDA, like runny Romy Neri and his ilk. (Hey Romy, how true is it that you didn't show up at your Ateneo batch's high school reunion last December huh?) NEDA has lost any semblance of credibility in being able to mitigate the various "business interests" being favored by the bribe-able/bribed heads of the different government agencies. NEDA has lost its ability to check-and-balance questionable projects that are being pushed by the unscrupulous members of the presidentita's extended family and friends. 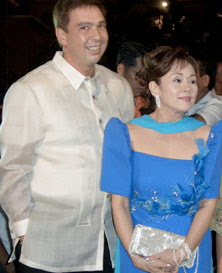 But then I don't see why the presidentita should change Tito "ang bigat ng eyebags ko" Santos, the acting DG at NEDA. He's been just fabulous at letting her have its way anyway. Remember how he refused to hand over to the Senate the minutes of the meeting when the ICC deliberated on the ZTE-NBN project? Perhaps the NEDA appointment is a reward for Ate Vi, governor of Lipa City, Batangas, who has kept her mouth dutifully shut about the reported P500,000 cash gift doled out to the presidentita's supporters at a gathering in Malacañang last October. Who knows, maybe even Ate Vi was the one who asked the little swamp creature to give her husband – who lost in the last elections exactly because of the E-VAT measure — a job? Baka bored na si Mister dahil walang ginagawa, at takot si Misis na baka mapadaan ulit si Mister sa Quezon Blvd.? Well, Happy frigging New Year to y'all!